In 2014, our colleague Tamar Sternthal analysed a tendentious and astonishingly sloppy article at Newsweek by journalist Sarah Helm, uncovering a myriad of factual errors or distortions. 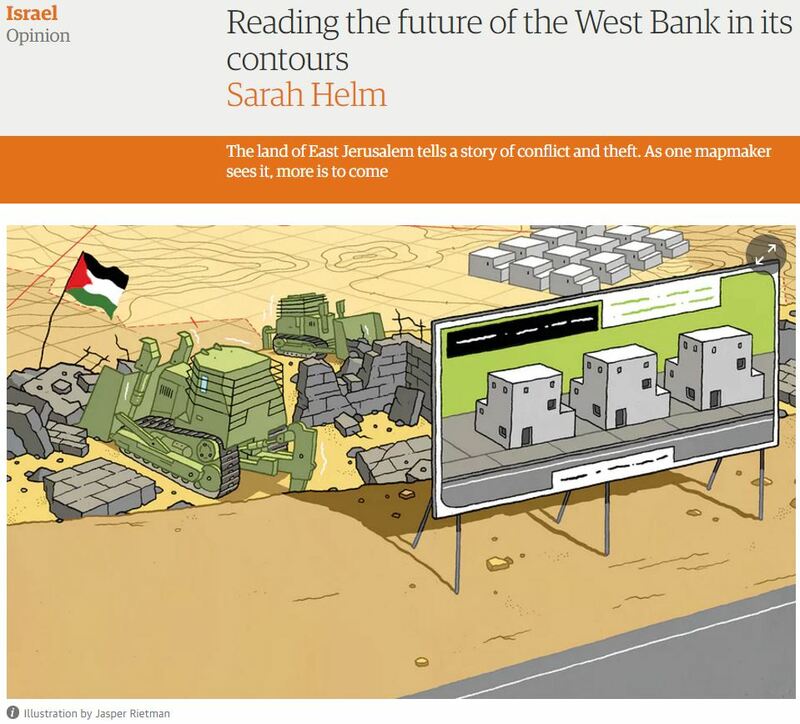 A Feb. 13th Guardian article written by Helm, “Reading the future of the West Bank in its contour” was similarly sloppy and misleading in amplifying the propagandistic musings of a Palestinian “cartographer” named Khalil Tufakji. First, a tunnel under Mt. of Olives? I’ve been listening to Tufakji since the mid-1990s and everything he foresaw has so far come true. 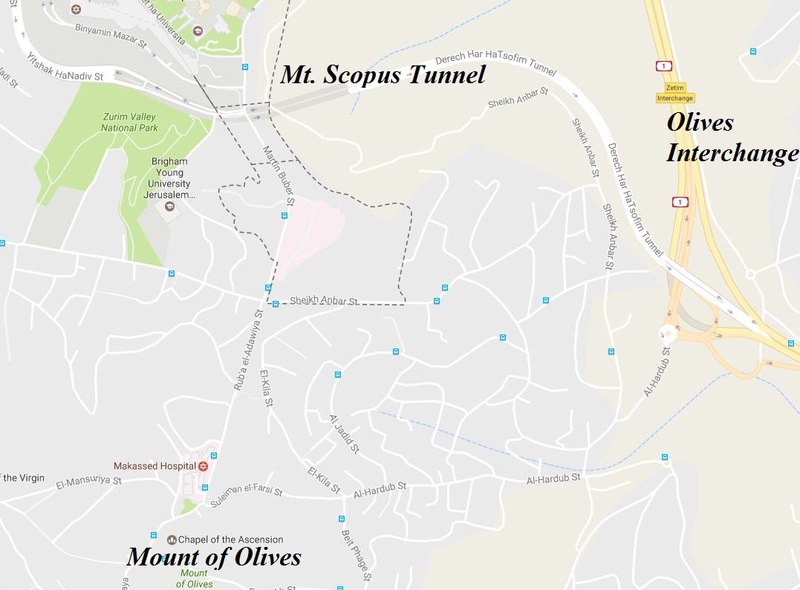 He pointed out where a tunnel would be drilled through the Mount of Olives to connect settlements – it seemed impossible but we are now driving through it. Either way, if you simply look on Google maps, it’s clear there is no tunnel under Mt. of Olives. Here’s the second problem – a planned airport on a Muslim holy site in the West Bank? Tufakji has tried and failed to get the international community to see that the conflict is all about the land. Now, he says, it’s too late. Looking further into the future, he describes Israel’s master plan for 2050 and his tone switches from despair to fear. The 2050 plan envisages a huge new airport beyond Maale Adumim on land occupied by Nebi Musa, an ancient Muslim holy site dedicated to Moses. We could not find any evidence whatsoever of such an Israeli government plan. The closest thing we could find of the plan mentioned by Tufakji is a private initiative by an Australian real estate investor named Kevin Bermeister. The plan, known as the Jerusalem 5800 Master Plan, includes the airport mentioned in the article. But, of course, the plan hasn’t even been considered, yet alone adopted, by the Israeli government. Even anti-Israel commentators who recently reported on the plan were clear that it is merely a private, right-wing initiative. Error number three – east Jerusalem was “100% Palestinian”. Tufakji lists countless UN resolutions passed only to be followed by settlement expansion. Today there are 630,000 settlers in Arab East Jerusalem and the West Bank, both illegally occupied since 1967. In East Jerusalem, 87% of the land is now under Israeli control “which leaves 13% for the Palestinians in East Jerusalem, down from 100% in 1967. Soon there’ll be none,” says Tufakji. Helm made a similar claim in her Newsweek article in 2012. However, as Sternthal pointed out at the time, what Helm characterises as “100%” Palestinian east Jerusalem includes the Jewish Quarter of the Old City, whose Jewish population was entirely expelled – and their property stolen – during the 1948 war. Indeed, the neighborhood (Sheikh Jarrah or Shimon HaTzadik) had been Jewish-owned from 1867 to 1948. To complain about these errors, you can tweet Ms. Helm @SarahHelm1, or contact the Guardian’s readers’ editor at guardian.readers@theguardian.com. As always, when communicating with journalists (including on Twitter), always be respectful and stick to the facts. The Guardian is ‘on about’ fake news. Claiming it to be in ‘other media’. And, of course, honest introspection is not a part of the Guardian editors ‘remit’. “Guardian journalist” is an oxymoron. Another one is Islam is “The Religion of Peace”. The Mount of Olives tunnel connects to the dams that are opened to flood Gaza. There is a very clear fourth error in Sarah Helm’s article. It is simply not true that “Arab East Jerusalem and the West Bank” are “illegally occupied since 1967”. The international consensus is that the occupation itself is legal in international law. This is not seriously disputed, especially bearing in mind that in 1967 Jordan attacked Israel. This reminds me of the nonexistent bridge between Gaza and the West Bank that Vox wrote about a few years ago. At least Vox had the decency to put out a retraction. Not so with the Guardian. In truth this woman needs to be fired.